The dismantling of Net Neutrality hurts innovators, artists, pupils, and everything in between. 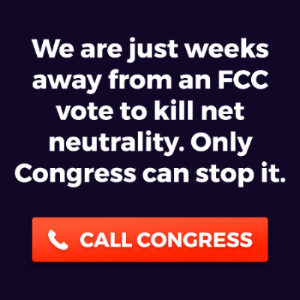 Take a brief moment from your day and help us beat the FCC, encourage a free and open internet where ideas can come together, and defend our freedom. Net neutrality is the principle that internet service providers (ISPs) like Cox & ATT&T should not control what we see and do online. In 2015, startups, Internet freedom groups, and 3.7 million commenters won strong net neutrality rules from the US Federal Communication Commission (FCC). The rules prohibit Internet providers from blocking, throttling, and paid prioritization—"fast lanes" for sites that pay, and slow lanes for everyone else. Here's what you can expect your internet to start looking like without Net Neutrality. The rich get richer, but the poor get even more poor in terms of dollars AND knowledge and accesabilty to things they regularly need. Portugal's non-nuetral internet has broken sites into packages (click for source).